We set out how the assessment of plant closure vs alternatives requires a structured investment decision framework. Plant closure decisions are usually driven by expected profit. But a simple assessment of plant profitability is usually an inadequate approach to inform a plant closure decision. A robust investment decision framework allows a plant owner to quantify and assess the risk/return distributions of alternative options as the plant progresses towards closure. Today we follow on from last week’s article on drivers of plant closure by exploring a practical case study of CCGT end of life investment decisions. 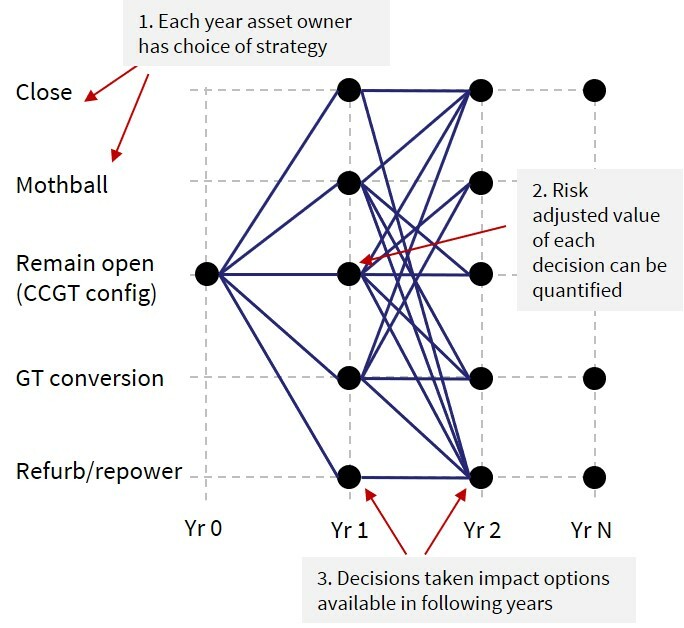 CCGT plants usually face a key investment decision around 25 years of age. The exact timing depends on technology, run hours and operation profiles. But life extension beyond this point typically requires major capex spend e.g. relating to replacement of steam generator components. Mothball: Substantially reducing fixed costs to retain the option of reopening the plant in the future (this only makes sense for certain assets and market conditions e.g. Netherlands and Germany both have significant mothballed CCGT capacity in anticipation of a tightening capacity balance). A structured approach is required to properly quantify and compare the relative risk/return of these different options. This requires a robust probabilistic plant modelling framework that generates realistic distributions of asset margin under each of the alternative options. A nodal decision tree can then be constructed to estimate risk adjusted values for different investment options as illustrated in Chart 1. This framework can be assessed for example on an annual basis as the plant ages and market & operational conditions change. But it is important to note that options are impacted by decisions taken i.e. there is a ‘path dependence’ problem that needs to be properly analysed and accounted for. DCF / NPV calculations to support investment decisions may require use of multiple discount rates, depending on the nature of the uncertainties associated with the various options (which can be very different). It is no coincidence that commodity traders and private equity firms are buying mid-life thermal power assets across Europe (e.g. KKR French CCGTs, Vitol Immingham CCGT, Castleton Rotterdam CCGT, ECP Saltend & Deeside CCGTs). The first of these factors requires a strong trading capability (either in-house or via route to market contract). The second factor requires strong expertise on plant investment optionality & cost structuring. Applying the investment approach we describe above can unlock significant upside value from ageing assets. This is a key factor behind the increasing trend in change of ownership of mid-life thermal assets, as traditional utility owners sell to specialist investors.